The project manager, or PM, is responsible for planning and seeing a project from its initiation to its completion. A PM generally has to have strong leadership and communication skills, as well as the ability to keep others motivated and on track. Some other roles may include overseeing the scope of the project, planning out resources, time management, and monitoring progress throughout the project. Commonly known as the repository maintainer, but known in WDI as the "git master", the git master&apos;s job is to handle incoming pull requests and merge them appropriately. Their job is to handle the state of the repo and make sure that everything goes smoothly. Be prepared for merge conflicts if necessary. This role will likely be used if you are working with foreign technologies or complex topics, such as D3, front end plugins, machine learning, etc. 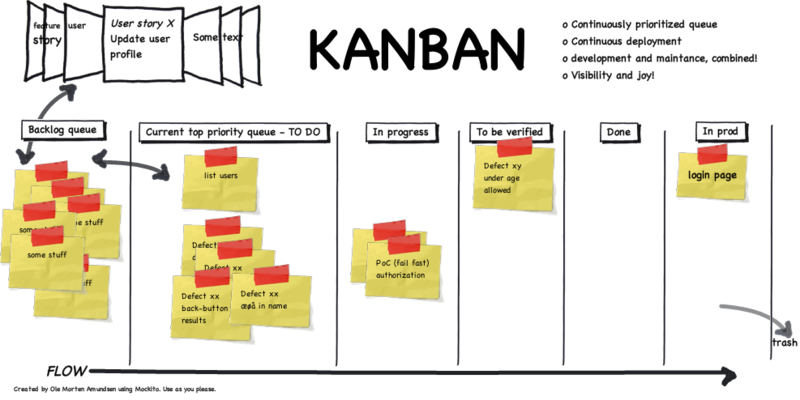 Kanban literally means billboard in Japanese. For software purposes, it&apos;s a board to keep track of logistics and production. Normally, there would be a section for testing, but since the development cycle in this class is one week, the section will likely be empty most of the time. However, feel free to add it if you&apos;d like.